As a Singapore-homegrown engineering group, ST Engineering specialises in innovative solutions and services in the Aerospace, Electronics, Land Systems and Marine sectors. It was formed in 1997 and has grown to be one of Asia's largest defence and engineering groups to date. A leader in each of its sectors of business, ST Engineering offers integrated and innovative solutions for its customers in both commercial and defence organisations in over 100 countries. It serves these organisations through a global network of over 100 subsidiaries and associated companies in 46 cities across 24 countries in the Americas, Asia, Europe and the Middle East. The crossfeeding of engineering capabilities and technologies across its aerospace, electronics, land systems and marine businesses, underscores the Group's capability to address its customers' changing needs. These will only be possible with its most valuable asset – the 23,000 employees across the world. People are ST Engineering's greatest asset and it seeks to empower every individual to be the author of their own ambitions, grow with the organisation and fulfil their fullest potential. In ST Engineering, innovation is not just about technology – it comes from the minds that drive it. ST Engineering is poised to harness the opportunities and meet the challenges that the future brings. It does this by consistently developing future leaders through the talent pipelines across the company. Some of these innovative leaders include Nicholas Yap, Chua Xin Pei, Low Jin Yi and Wong Wen Hao, all of whom are scholars with ST Engineering! If you want to be a part of this global family and create possibilities and solutions to meet the needs of the future, join the ST Engineering family. 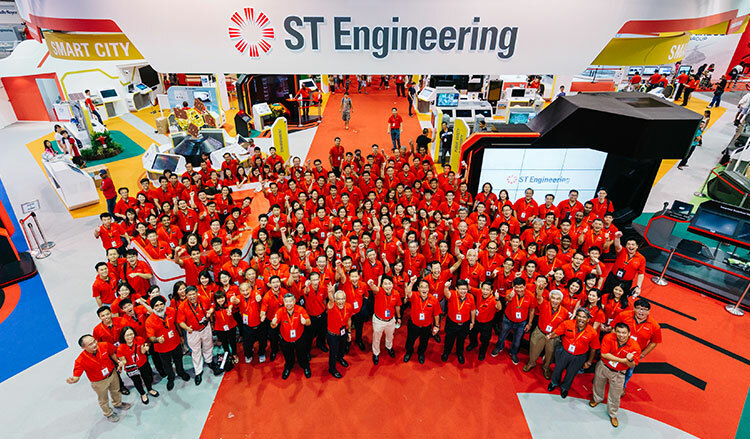 Photo caption: The ST Engineering family celebrating a successful campaign at Singapore Airshow 2016. Search BrightSparks for the ST Engineering Scholarship and more!